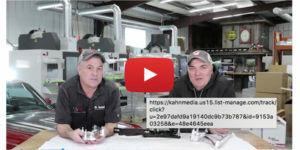 Jim and Mike Ring, co-owners and founders of Ringbrothers, have been engineering, designing and developing billet parts since they began their business more than 15 years ago. Now, they are the latest victims in what has become an increasing trend in the automotive aftermarket – counterfeit products. The Rings say they believe in honesty and transparency and they felt the need to put out a message to the industry to inform consumers that others are knocking off their products. The Rings want to make sure that customers are protected and are making informed purchasing choices. To view their message, click here.